The digital age has brought with it many problems, one of them being volumes of files to sort through and store safely. From school documents to work files and family photos to financial documents, you’re probably wondering how to keep them out of sight but still within reach. This guide will help you organize your digital files. While there’s no one-size-fits-all solution to this problem, here’s a practical five-step strategy used by experts all over the world that you too can consider. The sorting and organization process involves a few deletions. You don’t want to accidentally delete something you may need in the future. So, begin with a backup. Backup solutions include a second computer in the office, a company server, or cloud solutions such as Dropbox, Google Drive, iCloud, and OneDrive. Now that you’re done backing up, it’s time to clean up. Go through your computer manually, identifying and deleting the files you don’t need. Don’t forget to uninstall programs you currently don’t need too. Then, empty the recycle bin. When that’s done, go one step further and use Disk Utility for Mac or Disk Cleanup for PC to delete any minor files unnecessarily taking up space on your computer. Alternatively, use a reliable third-party disk cleaning application for the job. Finally, head to your browsers and delete cookies and cache. You might not be aware, but these elements take up memory space too. If working at a company or on a networked system, it’s likely that the IT department has allocated a personal file folder or drive space on the server for each employee/user. This is the best possible location to store your files since most IT departments backup files nightly. If working from a single computer, however, store your files on the computer hard drive, but have a cloud sync in place to automatically store a version of new files in your secure, cloud storage area. Not having a backup is a big no-no. After you are done with the files, move them to the right folders or delete them. If you’re working on PC, use the extended Windows Explorer tool to organize the files. For Mac, use the Mac Drive icon found on the desktop. To find the Windows Explorer program, click; Start > Programs > Accessories > Windows Explorer. Next up, create a folder view. To do this, on Windows, click the Folders icon in the toolbar. A double-pane column view will be created; the left pane lists primary folders while the right pane lists all the files in a highlighted folder. On Mac, click the view that offers multiple columns. Finally, move all your files into the folders you’ve created. Both Windows and Mac allow users to simply drag and drop files into folders. For the best outcome, there are two rules to observe. First, where you’re dealing with more than 30 files, create sub-folders within the parent folder and move the files to match sub-folders. Secondly, keep the number of folders and sub-folders to a minimum. Naming is critical. The names and naming strategy used will determine the ease of locating your files and folders. One of the best approaches is to name them by date. This makes tracing back to old files easy. Other strategies to consider include naming based on company and naming by document type (personal, business, school, etc). Or, use a combination of these strategies. 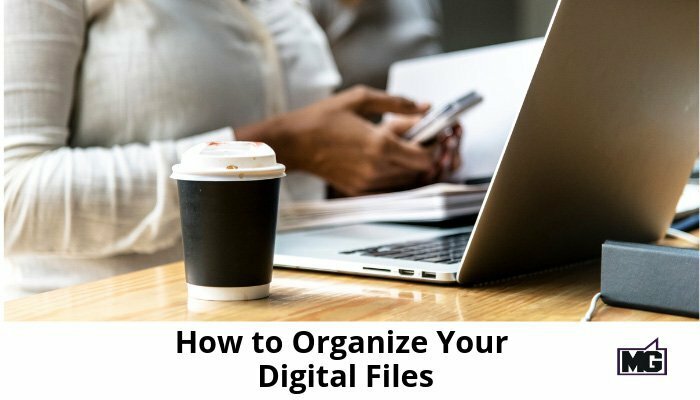 Hopefully, that gives you some guidance on the need for and how to organize your digital files. Mike Gingerich is President of Digital Hill Multimedia (www.DigitalHill.com), a Goshen web design and marketing agency. He is also a co-founder of TabSite.com and Waftio.com, leading software tools for contests and lead capture, and author of the book Game Plan for Social Media Lead Generation. Find out more at www.MikeGingerich.com/book.